SAN FRANCISCO, Calif., October 13, 2017 — Purism, maker of security focused hardware and software, today announced a collaboration with Monero, the only secure decentralized currency that is private by default. Purism recently started accepting Monero for payments in its online store, and this is a continuation of the company’s support for the cryptocurrency. As more central services like Equifax are hacked, exposing vulnerable user data in unprecedented ways that cause permanent damage to people’s privacy, it has become clear that centralized, individually identifiable, historic, and permanent digital footprints create a serious threat to digital privacy and human rights. Purism, on the heels of its successful smartphone crowdfunding campaign which has raised more than $1.5 million, is looking to address this threat by incorporating cryptocurrencies by default into its mobile phone design, beginning with Monero. Monero’s cryptocurrency offers a fungible, decentralized, private currency that is created to be identical to centuries of physical world transaction processes, primarily that cash given for goods or services is a one-time, non-recorded, mutual transaction. “Collaborating with Purism addresses a major pain point for Monero. The Librem 5 makes it easy for the average user to use Monero for real world transactions on a mobile platform. In addition, the Librem 5, by using Free Libre Open Source Software provides the user with the opportunity to verify to a very high level its end point security, privacy and decentralization. This is in sharp contrast to many mobile platforms where the user has to trust a proprietary implementation. I am very excited to see the Librem 5 planning to have Monero support by default,” Francisco Cabañas, Core Team Member, The Monero Project. “Creating a future where a person can buy or sell digital goods or services and still respect their privacy, similarly to cash but on the Internet, is a long-time dream that we plan to make a reality,” says Weaver. 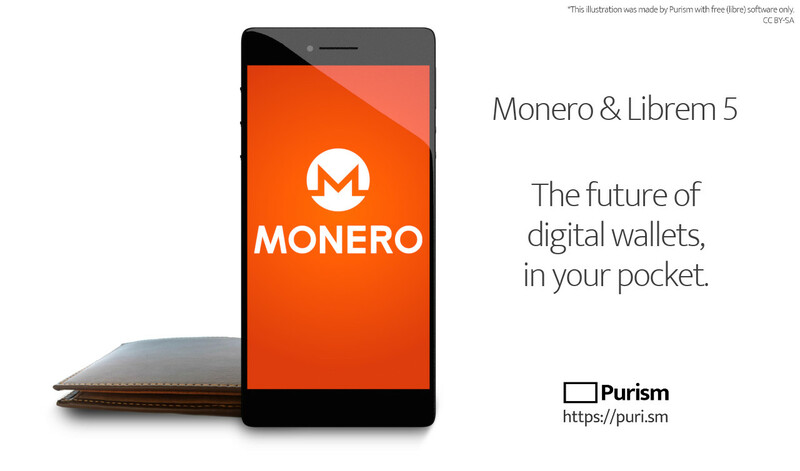 Integrating Monero into Purism’s Librem 5 smartphone as part of its default mobile payment system can solve the problems plaguing the online transaction space, removing banks from the transaction, removing all central storage of private user data, keeping transactions private between two parties, all backed by the strength of an immutable cryptographic blockchain ledger. The Monero Project is a grassroots, community-driven initiative that advocates for privacy on a global scale by producing several free libre open source software projects, with the flagship offering being Monero, a fungible and decentralized cryptocurrency. The important guiding philosophies of Monero are security (ensuring that users are able to trust Monero with their transactions, without risk of error or attack), privacy (ensuring that users can transact Monero without fear of coercion, censorship, or surveillance), and decentralization (ensuring that no single person or group can control the network or reverse transactions). The goal is to provide a level of fungibility and privacy that is analogous to that of cash for the digital world. Purism is a Social Purpose Corporation devoted to bringing security, privacy, software freedom, and digital independence to everyone’s personal computing experience. With operations based in San Francisco (California) and around the world, Purism manufactures premium-quality laptops and phones, creating beautiful and powerful devices meant to protect users’ digital lives without requiring a compromise on ease of use. Purism designs and assembles its hardware by carefully selecting internationally sourced components to be privacy-respecting and fully Free-Software-compliant. Security and privacy-centric features come built-in with every product Purism makes, making security and privacy the simpler, logical choice for individuals and businesses. Marie Williams, Coderella / Purism +1 415-689-4029 pr@puri.sm See also the Purism press room for additional tools and announcements.